Anvil: War of Heroes is a unique strategy game from Big Fish Games. Enter the ancient world to call upon the gods and unleash their powers on those who stand before you. 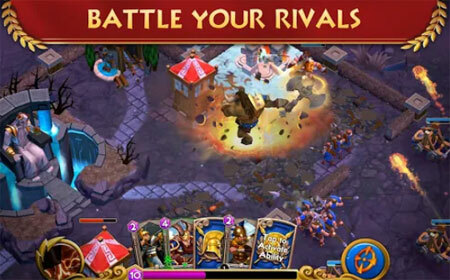 Amass your army of mythical heroes and monsters to lay waste to the cities of your foes in real-time. Collect unique defense towers to construct a fortress that can withstand any assault from other players worldwide. Forge your friendships and enter a guild alliance to share your best characters and reap the rewards returned to you. Work your way through the leagues to rise to the top of the mountain and sit as an immortal amongst the gods. If you get stuck in the game, check out the video walkthrough and gameplay for the game. This entry was posted in Android Games, iOS Games, Mobile Games, Walkthrough and tagged Anvil: War of Heroes Cheats, Anvil: War of Heroes Game, Anvil: War of Heroes Gameplay, Anvil: War of Heroes Guide, Anvil: War of Heroes Hints, Anvil: War of Heroes Review, Anvil: War of Heroes Solutions, Anvil: War of Heroes Strategy, Anvil: War of Heroes Tips, Anvil: War of Heroes Walkthrough by Marvin. Bookmark the permalink.